I hadn’t planned to write about my toilet adventures, but several people have messaged me following my recent Facebook post to say it was the funniest story they’d heard and that I should blog about it. So much for writing a refined, sophisticated blog then…. I published the story as a helpful tip of the day: when travelling on a train, if you need to use the loo don’t hang a heavy bag on the coat hook on the back of the door. Yes, this is advice based on experience… The train jerked, the bag swung, it knocked the lock, the lock opened… a man walked in! I’m not sure which of us shrieked louder but he beat a hasty retreat. Under the circumstances, I think he probably should have married me. That would have been the rule in the days of Seven brides for seven brothers, for sure. I was on my way to Leamington Spa to meet with some super clients. We had lunch in a hotel on the outskirts of town then chatted about their social media marketing strategy for 2017. We’re into the third week of the new year now, yet many people I’ve spoken to haven’t defined their goals for this year, or the path they intend to take to score them. I have. I just keep getting a bit distracted from stepping onto that path. One of my ongoing personal goals is to travel more, and there are hundreds of wonderful places in the UK that I haven’t seen. So this weekend we started with Bristol, a dynamic city with an over-abundance of wonderful places to eat, enmeshed in culture, arts and the kind of lovely architecture that can keep me busy for hours, just staring at Corinthian columns and great feats of engineering. 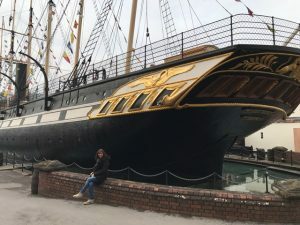 We also visited his masterpiece of the seas: the SS Great Britain, the former passenger steamship that is now a museum. It’s being preserved and restored, with the hull ensconced in a giant dehumidification chamber within a dry dock – no one will be smashing the glass ceiling here. Conservation work is taking place to control the rust corrosion; I know a bit about this as Hayley is doing similar work on the Mary Rose, Henry VIII’s recovered warship. Her PhD focuses on ways to control rust in order to save historical artefacts and she’s working specifically on iron objects from the Tudor ship. Generally, if we leave things, they rust, rot, decay, fall apart and fail to serve their purpose. This is also true of social media in business. Constant care is needed to ensure fresh and healthy ongoing marketing – I’d be happy to help if you’re not sure which way to steer yours. Within the last two months I’ve been on a plane, a train (as you now know!) and within the next two I’ll be going on a boat (not in the dry dock – across the sea). Bacharach and David put these appropriate words on Dionne Warwick’s lips: ‘Trains and boats and planes are passing by, they mean a trip to Paris or Rome for someone else but not for me. The trains and boats and planes took you away, away from me.’ Actually, they’re not appropriate lyrics at all!! They’re miserable! The tune’s nice though. In these days of social media no one gets taken away; in the business world, everyone is just a few clicks closer. And how wonderful is that?!! 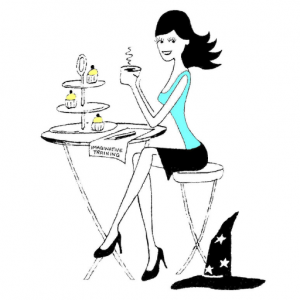 If you’d like me to show you how to expand and shrink your world at the same time, give me a call – or ask me here: @WeekendWitch.